Why should I have to buy the number?!?!?!?!?!?! It used to work great but lately just about every call is dropped. When I go to dial a number the signal indicator shows an ‘Excellent’ signal, but once I start talking the indicator changes to ‘poor’ then the signal goes out, voices crack and echo then the call drops. I will not be renewing my subscription! Horrible. I’ve had this app for months now and in all that time there are only a few times in which an incoming call rings. 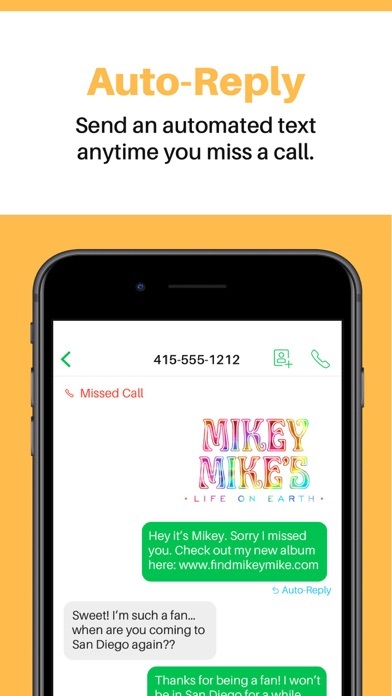 What it does is show as a missed call or people are asked to leave a message. I’ve called support five times at least and we are able to fix it temporarily in a couple of those cases. The last time I called, the tech person was very rude and assured me that I wouldn’t have any problems in the future. Well here I am in the future and when a call comes in there is no ringtone. Today, I went through all the things that the tech-support person asked me to do last time and there is no change. Unless things change immediately, I will be canceling my subscription. Aside from some weird bugs that kept me from receiving texts, the app has been pretty stable. The only issue I’ve been having is that when I have 2 phones near each other, each with the same sideline app phone number, certain calls won’t even show up when it’s supposed to, and I’ll just get a missed call notification. I’m hoping this won’t be a big problem later on. However, my biggest issue with this app is that you can only pay through iTunes. It’s such a big problem for me because I don’t have a dedicated work phone that’s linked to a dedicated business iTunes account. So every time I pay, I have to switch payment methods through the App Store. They don’t have a normal function where I can pay on their website, without going through the App Store, so I’m always stuck trying to change my payment method because I’m trying to keep business expenses on the business credit card. It just seems so lazy and inconsiderate to handle all payments through the App Store, and not even have the option of letting their customers pay directly. Good call quality but bad customer service. The calls quality aren’t bad. You can’t get your emails on the app, they go directly to your native phone number and you can’t see the caller’s number. The don’t have a customer service number, only email . . and I’m still waiting for the answer to fix the situation. The last 3 months now I’ve been double charged twice. The first time I went via the App Store and they told me I had the app installed twice, which isn’t possible, but refunded half my money. Now they are saying refunding the overpaid amount is not qualified and Sideline CS won’t give me a solid reason why I keep being double charged. I’m cancelling my subscription. To hell with this. The app freezes 99% of the time. I have to close it out and reopen several times before it starts working again. Then it will repeat. And I am a paid member. Terrible when you really need to use the app. I have also turned off and on the WiFi to see if that changes, check to make sure the app software is updated and even turn off my phone and back on to see if it works. But consistently around 90% of the time the app is freezing when using texts. Goes to blank white screen or can’t click on any buttons. Horrible experience for a prepaid 1-year service. When I first started with Sideline, it was $2.99/month and I planned on using it as a number for my psychotherapy practice after retirement. Before I ever got started I became disabled and had to shut down the business. With all that was going on, I forgot about the Sideline number. Now I received a notification that there was a payment problem (probably an expired credit card) and saw that the monthly charge is $9.99/month or $99/yr. I need to cancel but the instructions are obtuse. Please cancel this Sideline number. I downloaded this app for a 7-day trial.. on the 5th day, I decided it wasn’t a good app and tried to Unsubscribe but they Grayed out the Unsubscribe button, making it impossible to get rid of it, and I was forced into a monthly subscription I never wanted and they charged me $10. Apple is removing the charge but it’ll take 30 days to give me my money back. Don’t download this app if you value your money. Received too much spam from Sideline even though it’s a paid subscription. The support team is great! All it takes is one phone call and they can change my number as many times as I need to. Highly recommend! This App definitely needs an update! You cant search for a person you previously texted or called without scrolling. So I downloaded this app expecting to create another number, but as soon as i entered in my personal number along with a password, the app wouldn’t let me go any further. All it said was “create account” and so i clicked that and nothing happened. I closed the app and tried it multiple times with different passwords and received the same results. This app sounds like a cool idea, but my experiences with this one were not positive. I was disappointed when they changed to a paid model and charged so much for the service. But given that it is now a paid service, I expect that the functionality and user experience to be much better. Navigating between missed calls, texts, and voicemail is frustrating. More than half the time I tap on something I’m accidentally calling the contact I meant to just check texts of voicemail on. Please improve this app. Call quality is also intermittent, especially on data. 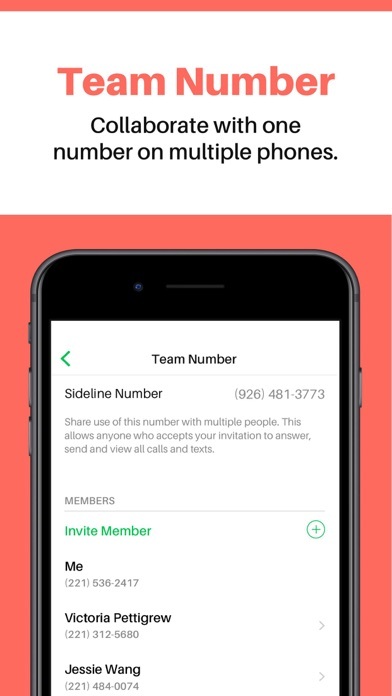 I really want this app to work well as I use it for my business line. 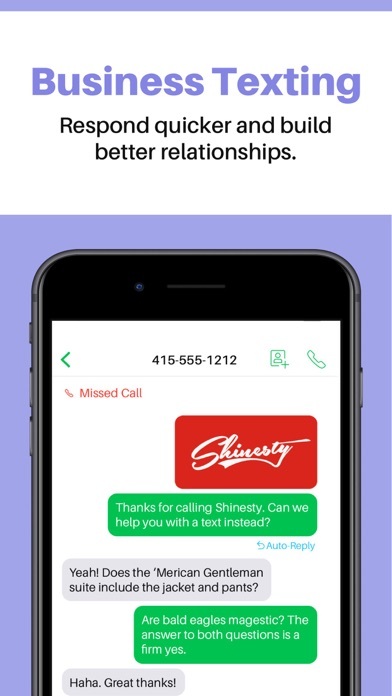 Started getting calls from random telemarketers through this app. Even after I dropped the subscription and deleted the app, the calls are still coming in on my actual phone number that I had linked to Sideline. I’m getting multiple calls a day from the same telemarketer. It’s getting annoying real fast. So beware. 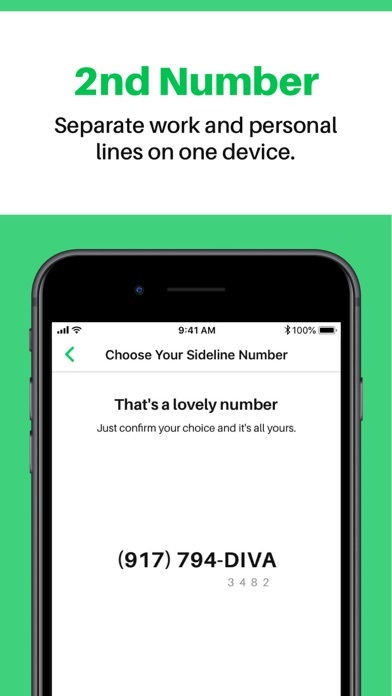 Seems like they sell your number. When I started using this number it was free. I had no issues. Now that I’m paying for this number I get non-stop telemarking calls. When my year is up, I will be canceling this line. Over it! Great app and very friendly to use it. 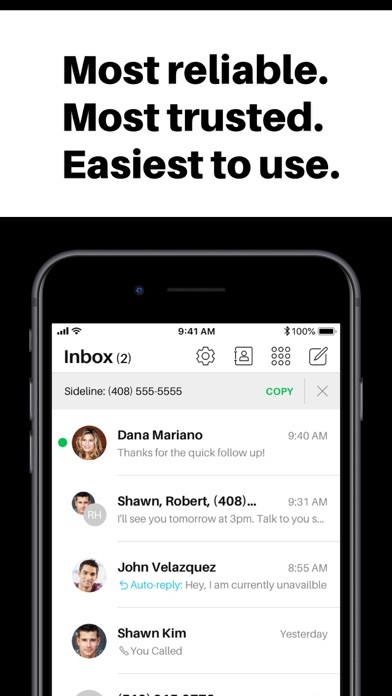 But I wish you guys could separate text message section and a phone call section to make the app look clean and also it would be great if you can have two phone numbers as the same time. Please cancel my subscription. My bank account was charged $10.71. It messed up my checking. I no longer want to be a subscriber. This is a really good app for messages and phone calls the only down side is that while driving you will have to hold to the to your ear or have it on speaker because they don’t have the capability to connect to the cars Bluetooth which a big bummer for me besides that it works great. The app works about 90% of the time. Sometimes if you receive a call the caller ID will say Incoming Sideline Call instead of the contact that is saved. Also the app doesn’t support GIFs and only shows them in an image mode. You also cannot like someone’s message like you can on other platforms. I think if they can work on these 3 things the app would simply be perfect. I’m hoping we can get this resolved in a future update.